Who knew there was a Deep State? « Gun Confiscation begins! YES, in the US! 9th Circuit Court rules that marijuana card holders cannot own firearms. There’s a Federal law banning sale of guns to illegal drug users. And yet they’re surprised by this. 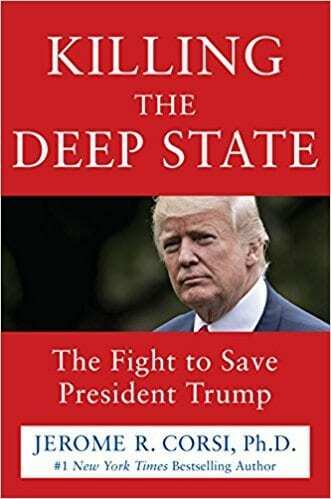 Dr. Jerome Corsi, author of “Killing the Deep State” says the FBI began plotting a coup d’etat as soon as Trump won the election. This is treason. It’s the first time I’ve ever had a book BANNED! I thought only Nazi’s burned book. So what’s Amazon and NYT doing? The extent that conspirators like James Comey, Andrew McCabe, and Peter Strok and went is unconscionable. Lying under oath is a crime, no matter what the lie is about. Trump is the target because he created the America First policy. We have Supreme Court Justices who make decisions based on foreign law! They’re globalists intent on demeaning the U.S. Constitution. The Far Left has gone SO FAR left that they aren’t even Democrats anymore. They’re socialists.